During the many crises that have engulfed the Arab region from the occupation of Iraq in 2003 to the latest upheaval in Yemen, a consistent theme of my analysis has been to emphasise the limitations of that much-touted panacea, “a political solution”. The proposition has gathered increasing force over the years: in those lands of the Arab spring where such a “solution” has been implemented or attempted (Libya, Syria, Iraq and Yemen), a range of destructive effects – extremism, separatist conflicts, the collapse of state institutions – has accelerated or been further incubated. The result is that “a political solution” to the regional divisions in Arab societies has become either an empty slogan, carelessly invoked as the all-purpose answer, or equally a form of wishful thinking. For this reason, it is vital to stress the importance of the humane solution; one that restores dignity, legitimacy and justice, and one that can offer a chance of reconstruction according to a clear methodology. A fresh commitment is required to develop a new Arab intellectual project that supersedes the current categorical divisions which have placed our nation between dichotomies of: religion and state, doctrine and emirate, Sunni and Shi’ite, Rafida and Salafism or ISIS and Al-Qaida. This is a call for Yemen and its people, and it is out of responsibility that I write these lines; to ensure that silence does not cast its apathetic shadow over the events in Yemen, the tragedy of state collapse, the displacement of thousands, the killing of innocent civilians and the destruction of property and heritage. When speaking of Yemen and the military intervention, heed must be taken of the military trail that leads from past wars to its tragic reality today. For the promises of revolutions and revolutionaries were repeatedly undermined throughout different periods of the modern history of Yemen. Today, the population in Yemen exceeds 24 million. Its constituents are varied, with loyalty to the centuries-old community known as Al-Zaidiyyah existing alongside that of the Shafi’ite Sunnah. In Yemen, the tribal structure strongly dominates society and appears whenever power calls. Houthis, who are associated with the Zaydi doctrine but do not represent its essence converging with the Sunnah, believe in the possibility of reclaiming the Imamate State; the latter disappeared following the revolt of 1970, during which the Hamiduddin family sought refuge in the Kingdom of Saudi Arabia. At that time, the hope was that Yemen would emerge from the revolution as a modern nation-state but instead, and along with its army, it regressed once more to tribal authority. While rural and highland regions remained outside of Ottoman control, an era of wars began with Yemeni resistance to Ottoman presence in and control over particular cities throughout two periods: the Yemen Eyalah (Province) period between 1539 and 1634, and the Yemen Wilayah (Administrative district) period between 1872 and 1911. Throughout its presence in Yemen, the Ottoman empire’s control remained restricted to Zabid, Mokha and Aden. The northern highlands (where Sa’ada is located today) were unstable, hotbeds of tribal and Zaydi rebellion and dissent against the Ottomans. After a long period of marginalisation and poverty, Sa’ada became the fertile soil from which an independent sentiment and identity was grown. In between these two aforementioned periods, Britain had begun exercising influence in Yemen by occupying Perim island, located at the entrance to the Red Sea, in 1799. Britain went on to occupy Aden, with its key location by the Red Sea, in 1839, though only after facing fierce opposition by its inhabitants. The Ottomans had attempted to annex Sana’a for the first time in 1849, but were met with grave losses which amounted to 1,500 troop deaths. The failed effort eventually forced them into surrendering to Imam Yahya in 1911. At the time he was ruler of the northern highlands, an area that was the source of repeated attacks by tribal leaders against the Ottomans. The result was the Treaty of Daan, which granted Imam Yahya self-rule over the Zaydi-controlled northern highlands, leaving the control of the central Shafi’ite region to the Turks, while Aden remained within the grip of the British Empire. A consequence of this period was increasing Yemeni sympathy towards the movement existing in Sa’ada and the northern highlands. The Ottoman state had asked for the assistance of my grandfather, Al Hussein bin Ali, to establish security and obedience in Asir against Mohammed bin Ali Al Idrisi’s revolt in 1910. The intervention then was to force the tribes into complying with the Ottoman state. Similarly, the northern Yemeni frontier continued to assert that it was the meeting-point of struggle with the north, and continued to clash with the Saudi neighbour on several occasions; this led Saudi Arabia into intervening recurrently to maintain the security and stability of its borders. The struggle for power in Yemen in those decades has left its mark. The current situation in Yemen appears to be drawn by the fragmentation produced in that momentous era; Aden and the South, the North and the Imamate, the central region with Sana’a and its Shafi’ite neighbours. It is a fate decided by history and one that continues to shape the reality in Yemen to this very day. The second major war and military invasion witnessed by Yemen began when Gamal Abdel Nasser, in support of Yemen’s then president, Abdullah Al Sallal, provided air cover in 1962. Nasser declared that “the revolution of Yemen is our revolution”, and sent an Egyptian force of as many as 70,000 troops – equivalent to a third of the Egyptian army – into Yemen. At that time, Egypt regarded the support of Jordan and Saudi Arabia for the Yemeni regime as a form of alliance between Arab reactionaries and the Imamate in Yemen (the latter, also called Mutawakkilite kingdom, had been established in 1918, and was to end in 1970 with the declaration of the People’s Democratic Republic of Yemen, or PDRY). Despite all that, the war – called “the September revolution” – failed to deliver Yemen to the shores of a modern nation-state. Instead it delivered the revolutionary state to a worse reality dominated by partisan interests, identity clashes and sectarian conflicts. The third period of armed contest in Yemen came with the Sa’ada conflict, covering six civil wars involving the revolutionary state (PDRY) and the unity state. The latter had been enshrined in the 1994 agreement, signed in Amman by joint Jordanian and Saudi efforts. Both these states stood consistently in support of the unification of Yemen. However, the unification project failed to materialise its goals against the backdrop of underdevelopment, poverty, unemployment, the absence of justice, and tribal influence: all of them persisting as the state’s biggest dilemmas and the reasons behind its ongoing tensions. The Sa’ada wars were incited between the government of Ali Abdullah Saleh on the one side and the Ansar Allah movement (known as “the Houthis”) on the other. 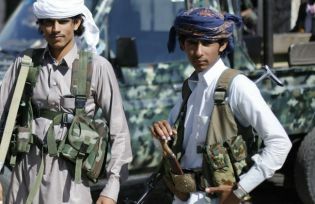 The start was in July 2004, when the Yemeni authorities arrested Hussein Al Houthi on the charge of establishing an armed organisation within the country. The fighting was restricted to the province of Sa’ada at first, but it later spread to Al Jawf, Hajjah and Amran. All three areas are part of today’s Aasifat al Hazm (Operation Decisive Storm), which covers the whole of Yemen and is turning the country into an epicentre of conflict, inflicting tens of casualties and hundreds of wounded on a daily basis. It seems however, that the wars against the Houthis are not limiting their power, but rather widening their support base. This was particularly seen in their previous wars against their former enemy (now turned ally), Yemen’s ex-president, Ali Abdullah Saleh. A feature of those previous wars was the aerial bombardment of Sa’ada and its neighbouring provinces, accompanied by military expansion and tribal participation; these were part of an attempt, led by Sheikh Abdullah Al Ahmar and Ali Muhsin Al Ahmar alongside other religious movements, to control and destroy the movement which originated from the House of the Hashemites, and which has historical ties with the Hashemite family in Hijaz. The wars waged against the Houthis have targeted the members of Badreddin al-Houthi’s family, yielding the life of his son Al Hussein amongst other family members. Since the Sa’ada wars of July 2004, however, what was asked of the Yemeni state and army was no more than the maintenance of security and stability, countering the spread of terrorism (which has taken the lives of hundreds in Yemen), and ensuring the security of the Red Sea (which too was continuously undermined). Instead, the army which collapsed so suddenly in the face of Houthi opposition, continued to be undermined by its weak foundations and its poor awareness of state affairs, as well as by foreign intervention. The Gulf Cooperation Council (GCC) initiative on 3 March 2011, part of the wave of Arab spring developments, sought to address the concerns of the young revolutionaries and ensure a peaceful transfer of power within the country. This led to the presidential elections of February 2012 and the instatement of Abd Rabbuh Hadi Mansour as acting president. After this process, most expected that the new leadership would shape the future of Yemen and its transitional phase. Instead, conflict and struggle continued to mark the transitional phase. Further efforts produced the Peace and National Partnership Agreement signed on 21 September 2014 in order to resolve the conflict between the Houthis, the authorities and the different political factions. Yet the hopes of return to dialogue and the uprooting of conflict were dashed. The United Nations envoy Jamal Benomar – who announced his decision to resign on 16 April – tried very hard to reconcile those who had never agreed to the division of roles within the state as much as they had agreed on the display of power to one another and to their external allies. Thus, Yemen’s short-lived spring was lost, culminating in today’s tragic situation of intensified sectarianism. The bombing operations targeting Badr and Al Hashoush mosques in Sana’a on 21 March 2015 took the lives of 142 people, amongst them the Houthi religious authority, the Imam of Badr Mosque, Al Murtada Zaid Al Mahtouri, one of the most respected Zaydi scholars in Yemen. The explosions, which additionally wounded 351 people, were claimed by ISIS and marked the beginning of internationalising the conflict, with the sudden foreign intervention by a Saudi Arabia-led regional coalition seeking to regain the balance of powers in the region. Today, Yemen marches through the tunnel of a deepening conflict on all its territory – land, air and sea. The country is in dire need of a decisive resolution that ends the conflict – but even more of solutions that establish humanitarian, economic, political and environmental security; restore human dignity; and honour the profound Yemeni self. Aasifat al Hazm (Operation Decisive Storm) must incorporate a political programme to rebuild Yemen, reinforcing the role of society based on respect for all stakeholders while moving away from sectarian and doctrinal classifications. It must also convince all the entities involved of the importance of Yemen’s security and stability, for that is a regional demand that extends beyond Yemen to all the Gulf and Red Sea states. In the last six years, Yemen has witnessed around eight wars which have created nothing but further divisions. The way forward now must be part and parcel of a regional settlement that establishes equality of independence for all peoples and states in order to guarantee an opening towards a humane, integrationist and objective regional stability. At the same time, though Yemen is indeed part of a delicate regional equation, it is also possesses specificities of its own, meaning that the real solution for Yemen can only be conceived from within the Yemeni womb rather than from outside. That must entail guarantees for a system of justice, dignity and real development in Sa’ada, one that also enables legal order and the restoration of rights. Moreover, those in charge of implementing the solution must refer to all the agreements and initiatives dating back to the document of Pledge and Accord signed in Amman in January 1994. The review of all the past efforts must culminate in holding a permanent regional meeting that aims to rehabilitate the forces of society, invest in capacity-building, and allocate funds in order to drain the pits of terrorism and to fill the vacuum of despair. In other words, the solution must adopt the approach of preventive treatment rather than curative treatment. Do the Houthis want the reinstatement of their current ally, Ali Abdullah Saleh? Or are they in search of an ancient right? Or is their concern more with an absent political equation and development? Or the deep fragmentation of Yemenis after the failure of the GCC initiative to rid Yemen, following a short spring, of its backwardness and the emergence of terrorism on its shores? This also raises the question of whether – now that Ali Abdullah Saleh has become an ally to the Houthis after years of battling against them – current president Abd Rabbuh Mansur Hadi and his team are capable of bearing the new responsibility. To repeat, my point of entry into the current situation in Yemen stems from the strong historical ties between my family and ancestors Al Hussein bin Ali, Abdullah bin Al Hussein and the noblemen of Yemen and the scholars and leaders of the various Islamic sects. Added to that is my moral obligation as an Arab intellectual who is of the view that the solution to end a reality dominated by sectarianism and polarisation lies in a formative view that makes consultation the ground for a constructive and above all humane solution. This consultation should act as a meeting-point for all societal forces to combine their efforts for the interest of the general public, which aims to rebuild society and enable individuals to learn in conjunction with a renewed Islamic thought, such as that of Imam Muhammad Al-Shawkani; one of the most notable scholars in modern Yemeni history. It must be a solution that prepares active citizens who are willing to stand up in defence of what the vast majority of Yemenis believe in, a healthy society that is devoid of hatred and fear.